Our bottom drawer of our kitchen island is dedicated to potatoes of all kinds. At any given time I keep a handful of sweet potatoes, Yukon gold potatoes, and Russet potatoes on hand. I’ve found I can pretty much make any type of meal from a variety of potatoes. These potato cakes make for a nice base for fried eggs, a topping for salads, or even eaten by themselves. 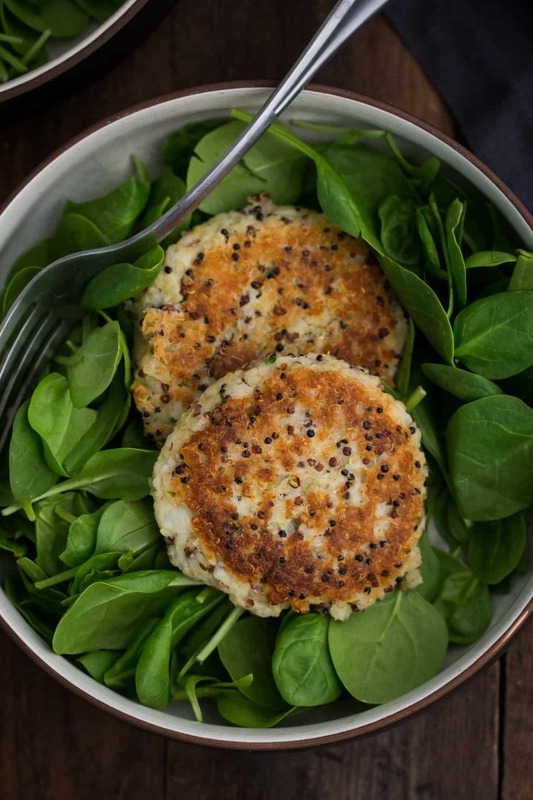 The quinoa provides an extra boost in nutrition- a perfect way to round out the potato cakes! 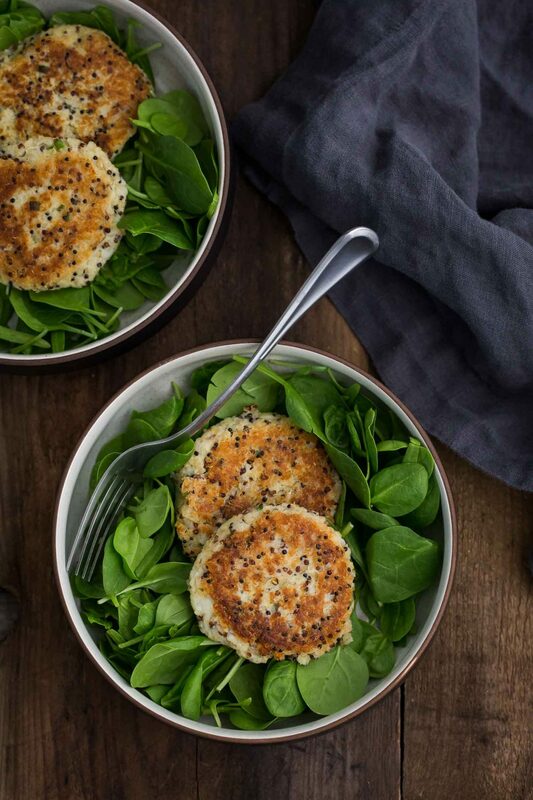 Simple potato cakes with a boost of help from quinoa. A perfect breakfast or dinner companion in salads or topped with eggs. In a medium bowl, combine the mashed potatoes with the cooked quinoa, chives, minced garlic, salt, and panko. In a separate bowl, whisk the egg and add to the bowl. Stir until the mixture is well combined. Heat a large skillet over medium-low heat and add the oil. Using an ice cream scoop or your hands, form cakes and place into the heated skillet. Repeat with as many cakes will fit in the pan, careful not to crowd. Cakes should be about ½” thick. Let cook for 4 to 5 minutes until brown and crisp. Flip and cook for another 4 to 5 minutes. Cakes should be crisp, brown, and hot all the way through. Serve with greens, poached eggs, or your favorite sauce. Tips & Tricks: The potato cakes hold together fairly well but I like to be gentle when flipping. I also like to really mold/shape the cakes in my hand before placing in the skillet. The base is fairly simple- it’s really about the quinoa and potatoes. Because the base is simple, it leaves room for the addition of your favorite flavors including, but not limited to herbs, cheese, and/or other vegetables. Cheese: Add ½ cup or so of sharp cheddar, goat cheese, or vegetarian-friendly parmesan to the mixture. Gluten-Free: use (or make) gluten-free friendly bread crumbs or make your own. Herbs: Get heavy hand with your herbs. Add freshly chopped parsley, thyme, and/or oregano. 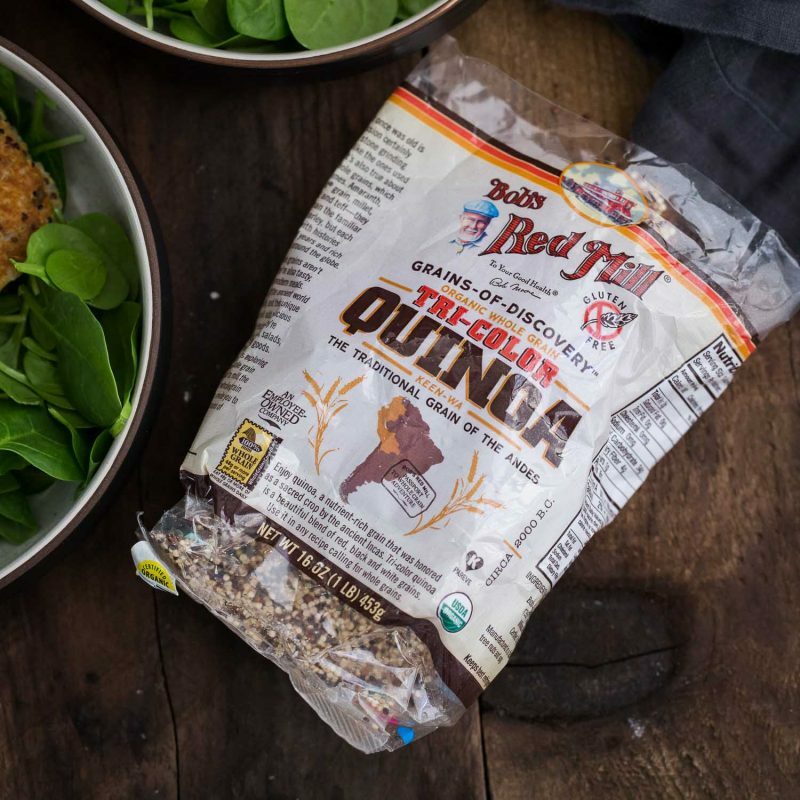 It’s probably no surprise that I have Bob’s Red Mill quinoa on hand at all times. It’s my go-to, quick cooking grain that helps me get dinner to the table fast. I love their tricolor quinoa, it’s beautiful and nutritional. A perfect base for grain bowls or bulking up a big lunch salad. 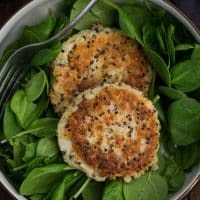 Thank you for the recipe of Quinoa Potato Cakes. It so amazing. I’ve not tried but I would do it before cooking and then cook from the frozen patty. Hi Ella, could you replace potatoes for sweet potatoes? I’ve not tried it but I think you could! Could the mixture keep in the fridge for a couple of days? I think so but I’ve not tried it. Is that one cup of quinoa that is then cooked or is it a cup after cooking? If after cooking how much dry/raw quinoa is this equivalent to? These were delicious and fairly easy to make 😀. Thanks for sharing!